A-sharp minor or A♯ minor is a minor scale based on A-sharp. Its key signature has seven sharps. Its relative major is C-sharp major. Its parallel major is A-sharp major. This is usually replaced by B-flat major, because A-sharp major's three double sharps in the key signature makes it generally impractical. Exceptions include Chopin's Polonaise-Fantaisie in A-flat major, Op. 61, which has a short passage of about 6 bars actually written in A-sharp major, putting in the necessary double-sharps as accidentals. This is part of a theme in B major, which modulates to A-sharp major for a little while. A-sharp minor has the enharmonic equivalent of B-flat minor. 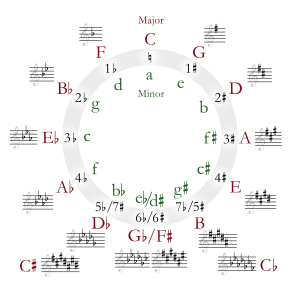 This is often used in most musical compositions instead of A-sharp minor, because A-sharp minor is not a useful key for compositions and is one of the least used minor keys in music. However, there were some composers in the past that have composed music in this key. Christian Heinrich Rinck wrote his Prelude No. 16 from Op. 15 in A-sharp minor. This page was last changed on 9 June 2016, at 02:15.